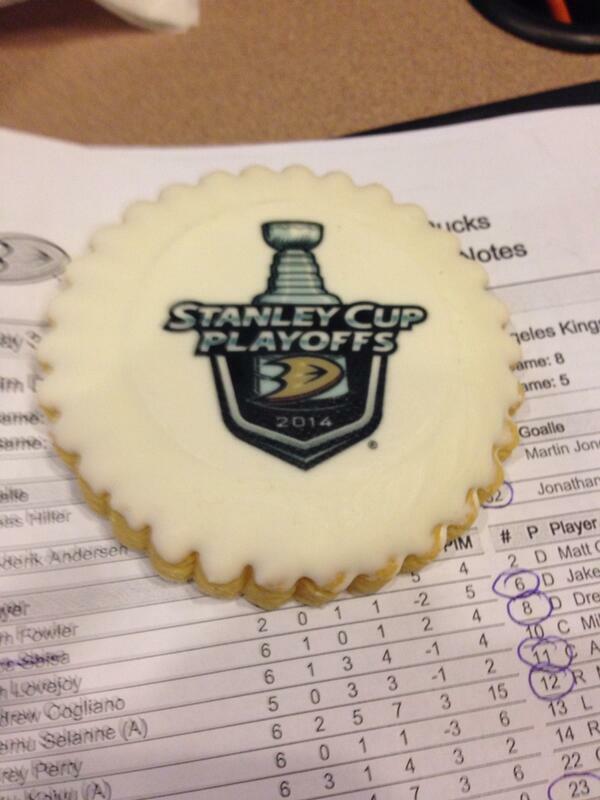 That wraps our updates of the Kings-Ducks Game 1. 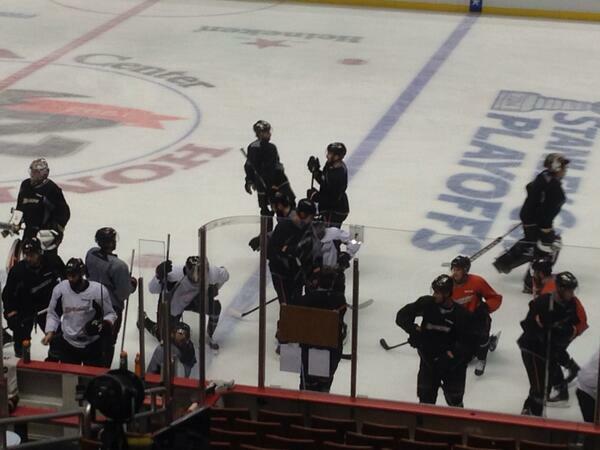 Game 2 is at 7 p.m.
Tuesday at Anaheim's Honda Center. We'll be there, covering it live. Matt Beleskey skating on the top line at Ducks practice. Hampus Lindholm and Mathieu Perreault skating as well. Back and better than ever for the #BattleofSoCal , it's @AdamJBrady 's Live Game Chat! A signed Getzlaf photo is tonight's prize. Link soon. 1 of his team’s second-round playoff series against the Kings on Saturday night at the Honda Center, but all signs pointed to Jonas Hiller getting the assignment. Kings were 0-4-1 against the Ducks in their season series. Kings, in addition to roll of four straight wins, have killed 15 consecutive penalties. Hiller leads Ducks onto ice. Getzlaf tells NBC, "We have to get bodies in front of" Quick. Hiller's start will be his first since April 6, when he suffered third straight loss and closed reg. season in 6-9-3 slump. Hiller's big 12 saves in Game 6 allowed Ducks to stage two-goal rally and win in OT Sunday. Seemed like in addition to getting pulled in two of last three games, @f_andersen30 just over being sick yesterday, too. 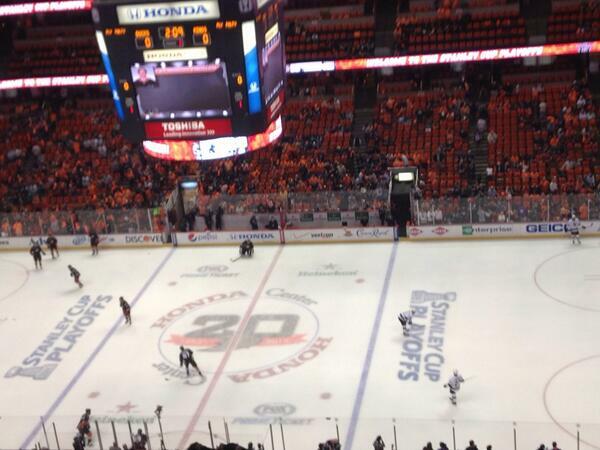 Not a surprise that there's a considerable number of Kings fans at Honda Center. I've spotted a black-and-white Dave Taylor jersey. Kings were a 56.7% 5v5 FenClose team this year, while Ducks were 50.2%. Teams w/ 5+ % adv. over opponent have won 25 of 32 series since '08. 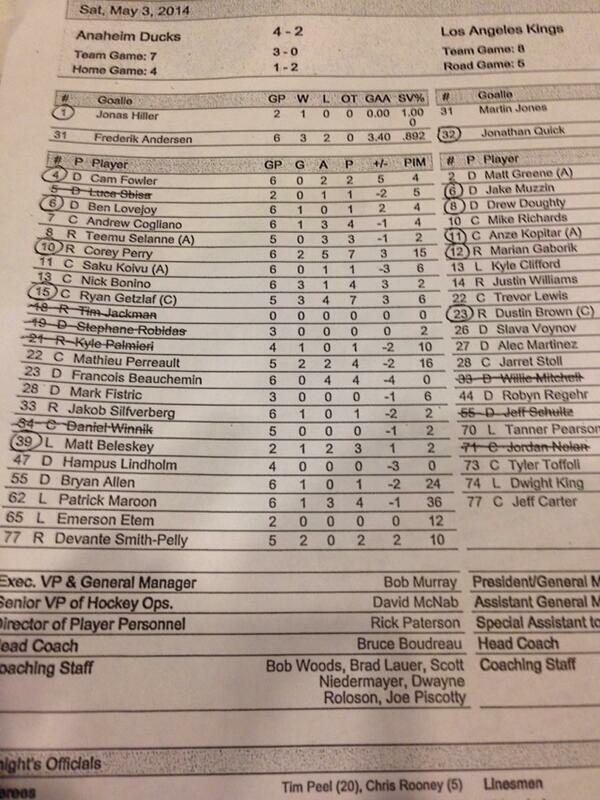 Ducks start Fowler, Lovejoy, Beleskey Perry, Getzlaf, Hiller. 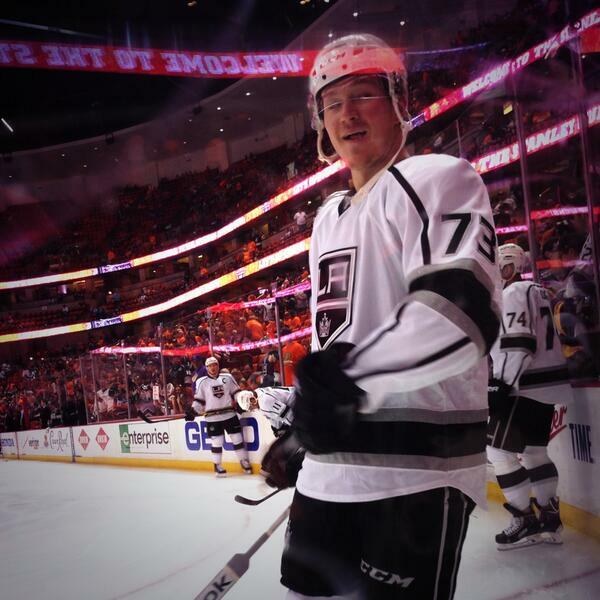 Kings' starters: Quick; Muzzin-Doughty; Gaborik-Kopitar-Brown. Scratch: Mitchell, Schultz, Nolan. Ducks scratch Sbisa, Jackman, Robidas, Palmieri, Winnik. Kings scratch Mitchell, Schultz, Nolan. 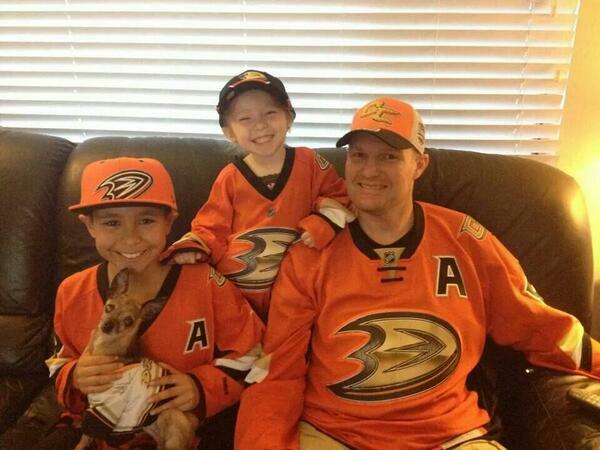 Ducks starters: Hiller; Fowler-Lovejoy; Beleskey-Getzlaf-Perry. Scratch: Sbisa, Jackman, Robidas, Palmieri, Winnik. Not many teams can scratch the likes of Daniel Winnik and Kyle Palmieri. The Ducks are doing it tonight for the second time in three games. Drew Doughty on facing #15 & #10 : "I’ve played Getzlaf and Perry so many times. I’ve played with them. I know exactly how they play...."
Doughty: "..I’ve studied how they play. They’re 2 of the hardest players to play in the league, no matter who is the third guy on that line"
Ducks recall center Rickard Rakell; maybe we'll see the Rick vs. Ric fourth line matchup (Mike Richards) later in the series. Per Ducks: Recalled center Rickard Rakell from Norfolk. Looking forward to a Rick v Rick matchup. Rakell vs Richards.